3 A two man climbing team is faster than a three-man team is. b| The strongest climber of a team always takes the hardest pitch. 9 Climbers will tie into their harnesses with a retrace figure-of-eight; they will not untie until they are off the climb, 10 ft back away from the cliff edge, or secured to an anchor point. d. As you climb you must use the correct climbing commands to prevent confusion. 3 Where possible, the leader should use natural anchors for protection. 9 The leader must not climb to the length of the rope before selecting a good belay stance, ideally 15 feet of rope is required for a belay anchor. 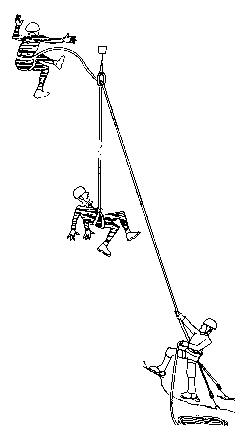 HfiWhen the lead climber reaches a good position, he will set up a belay position and bring up the #2 climber. g If a traverse is encountered it is protected as shown. The leader is not only protecting himself but also the #2 man as well. 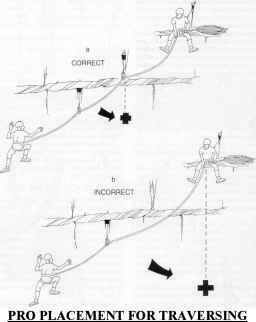 NOTE: Protecting a traverse: A: correct, placing protection after a hard move and a traverse can reduce the potential pendulum fall for the second climber. B: incorrect, if the second climber falls on the traverse with inadequate protection, he faces a long pendulum fall. TRANSITION: Now that we have discussed rules for placing pro, preventing rope drag and considerations for party climbing, are there any questions? Next we'll talk about the climbing commands used when party climbing. 7. (10 Min) CLIMBING COMMANDS. During a climb you will often find yourself in a position where you cannot see your climbing partner. This accompanied by the effects of wind, weather conditions or the distance between each other, often makes communication very difficult. For this reason we use a very strict set of commands in order to communicate with as little confusion as possible. I have a solid anchor, and am ready for you to climb. I am ready to begin the climb. I have reached a point where I am going to place protection, watch me. I am watching, giving or taking rope as needed. The climber has 25 feet of rope left, and must find a belay stance soon. The climber is about to fall. Allows climber to take rope that is needed. Telling belayer to take up excess rope. I am taking up excess rope. I am at the next belay and I am anchored. I have taken off the belay. NOTE: At this point the belayer becomes the number 2 climber and the lead climber is the belay man. NOTE: From this point on the commands are the same as before. I am secured on the belay/the rope is secure. NOTE: Practice of the above Tug commands is essential, as during the normal course of a climb the rope will move around in the belayer's hand and can deceive the belay man. TRANSITION: Now that we have discussed climbing commands, are there any questions? Without adequate communications, conducting a two-party climb can be extremely dangerous to both parties. With an understanding of belays, it is important to realize that during a multi-pitch climb the leader can fall beyond his belay man without hitting the ground, therefore it is important to learn about the forces exerted in such a fall. (10 Min) FALL FORCES. The general standard of climbing equipment is continually being improved. In the event of a fall by a lead climber, an enormous amount of force is applied on the rope. As the rope stretches, part of the energy converted into heat by the friction between the rope fibers. There are two parts in determining the force of a fall, Impact Force and Fall Factor. H Impact Force. 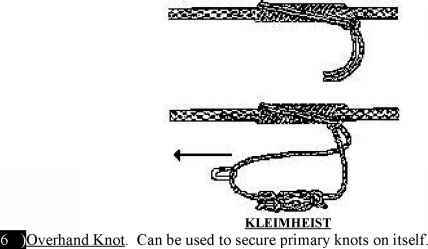 (Shock Force) This is the amount of force the belay man has to exert on a falling climber through the rope, anchor and belay device to stop his fall. The amount of impact force needed to stop his fall is determined by the fall factor. How to reduce fall factor climbing?